EARRINGS - SARAH COVENTRY. "ROYAL VELVET" FROM 1972. 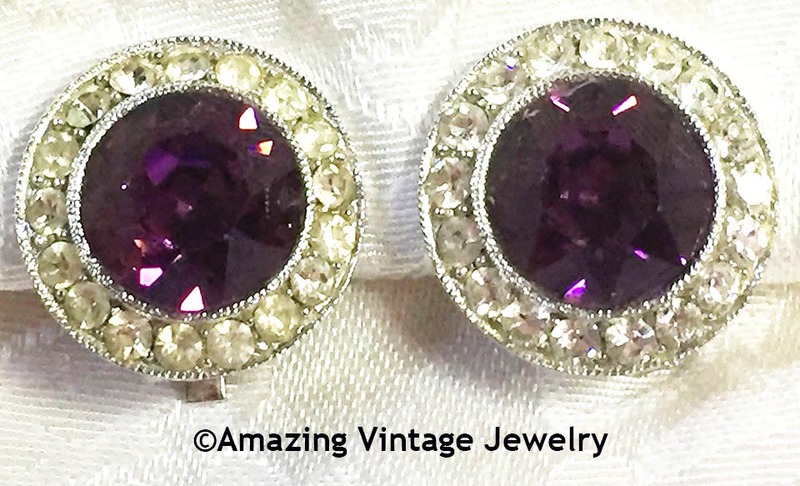 STUNNING PIECE IN SILVERTONE WITH LARGE PURPLE FACETED RHINESTONE CENTER, SURROUNDED BY BRIGHT, SPARKLING-CLEAR RHINESTONES. CLIP. 1" IN DIAMETER. VERY GOOD CONDITION WITH SOME YELLOWING TO SOME OF THE STONES - MORE SO WITH THE EARRING ON THE LEFT IN THE PHOTO. PRICED ACCORDINGLY.